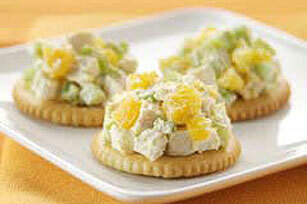 Snackers is a modest description of these curried chicken-topped crackers. Whatever you call them, guests will think they're delicious—and you're awesome! Mix all ingredients except crackers until well blended; cover. Spoon 2 tsp. of the mixture onto each cracker just before serving. Substitute golden raisins for the dried apricots. If raisins are large, chop them before using.